1 Bed 1 Bath 1,033 Sq. ft. 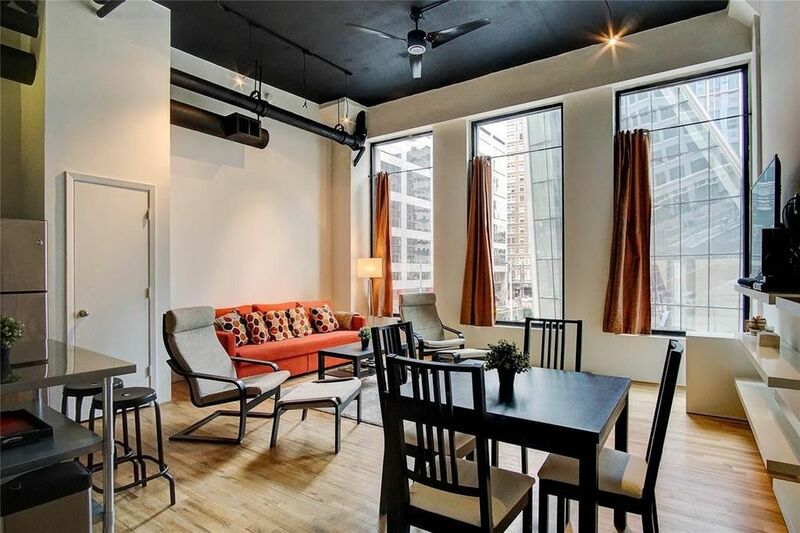 This stunning 1 bed 1 bath condo located in the heart of Downtown Houston is a dream come true! Kick back in the elegant family room that features hardwood flooring & a wall of windows that shower the room in natural light! Creating your favorite recipes is a true delight in the gorgeous kitchen equipped with tile backsplash, granite counters, hardwood flooring & under cabinet lighting! Withdraw at the end of the day to the spacious master bedroom complete with an extra tall ceiling & stained concrete flooring! The luxurious bathroom showcases concrete flooring & a tiled walk-in shower! The building has a gym with tons of workout equipment, a huge billiards & lounge room, an outdoor terrace & a parking garage! Fantastic location above Flying Saucer just across from the MetroRail and near the Theater District, Discovery Green Park and all the luxury shopping and dining destinations that Downtown has to offer! Community laundry facility within 20ft of unit! This one won't last long! Directions: Building is at the intersection of Main at Capitol. Please use nearby metered parking or nearby parking garage for showings. 1 beds 1 Bath 1,033 Sq. ft.